The band is a source of great pride for students, parents, teachers and employees. Every year the marching band attends 3-4 Bands of America competitions around Texas, and sometimes out of the state. The band program instills discipline, work ethic, music appreciation, fitness, camaraderie, and respect to all students involved. The Winston Churchill Marching Band is highly respected, nationally known, and are building tomorrow’s leaders. Your financial support goes to assisting the band including, but not limited to, instrument purchase and maintenance, uniform purchases, clinicians, transportation, and registration at state and national competitions. 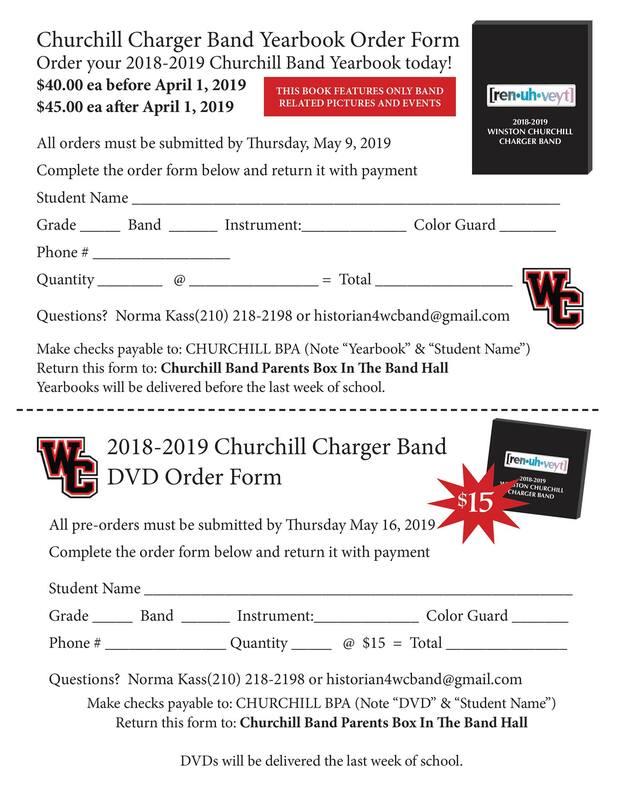 The Churchill Band Parent Association is a 501c3 organization and all portions of your donation are tax deductible. Sponsor information can also be downloaded here. Please contact Sharon Soave for more information on how to support the Charger Band!